In CLAT exam 2018, general knowledge and current awareness plays a major role. If you will check previous years question papers, you will find that from this section 50 questions are asked. In any competitive exam including CLAT, general awareness part comprise of Static GK and Current Affairs. Current affairs can be covered with help of a newspaper of national level. Newspaper should be read on daily basis without gap. 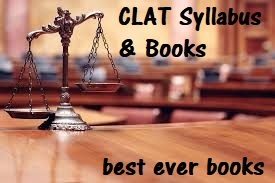 However, in market several books are available for CLAT preparation but they cannot be alternative of newspaper. CLAT Books of general awareness should always be read along with daily reading of newspaper. You can check given book for G.K. Read this book along with your board preparation as you have to learn lots of things which are asked as part of static G.K.
A student appearing for CLAT exam 2018 is expected to have inclination towards legal principles. But, it does not mean that they need to have in depth knowledge of various laws. Taxman’s publication is a good option to read books on law and accounts. This book explains topic in detail and good for legal reasoning. However, book has several mistakes in answers and beginners may get confused. Do practice of unseen passages because at least one passage of 400-450 words would be there in the CLAT paper. From grammar section common questions like; grammatical errors in the sentences, filling in appropriate words in a given sentence, etc. is asked. Solving Wren & Martin is best option for the purpose. However, few more books are available. You can purchase any one out of links given below. Last but not the least, Mathematics will comprise of 20 questions which will be from elementary mathematics. Candidates need to revise basic maths taught up to 10th standard. Admissions exam like JEE, NEET and CLAT need devoted strategy for success in exams.